Opponents of Milwaukee's streetcar project have until Thursday to turn in at least 31,000 signatures if they hope to put the issue on the ballot. Organizers admit they will likely fall short. 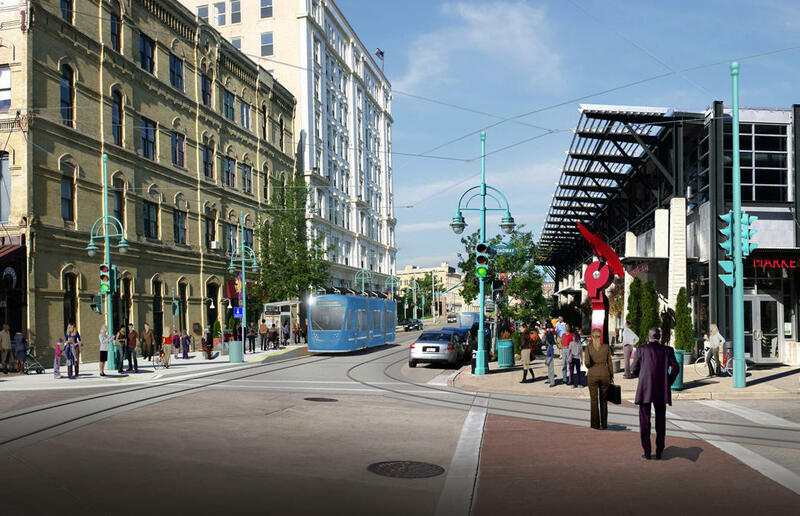 It’s been several weeks since the Milwaukee Common Council approved the building of a downtown streetcar. Planning is now underway. The initial leg would run from the lower east side through downtown to the Third Ward, with future extensions envisioned. Some business owners still harbor mixed feelings and questions. Dawn Bloomfield is confident Milwaukee’s streetcar will bring more customers into her establishment. She owns Club Charlie’s in the Third Ward. “Sometimes it’s hard to get them to walk to our bar in colder weather but I think if they eventually get down closer to the fifth ward, the people in the community will definitely use it,” Bloomfield says. But in a neighborhood north of downtown, another business owner worries. Elizabeth D’Acquisto owns Salone on Ogden Avenue. She’s been at the location for 17 years and is particularly concerned about how long it will take crews to lay the streetcar tracks and string the overhead wires. “I’m a small business owner who has enough struggle keeping our doors open anyway. So, one month, six months, a year, with no parking. That would probably destroy our business,” D’Acquisto says. D’Acquisto says when her lease recently came due, she did not sign for another 10 years. Instead, she committed to only three. She says that way, she can move or close her business, if the streets out front remain ripped up for too long. Another person who fears he might lose significant business during construction is Steve Stein. He owns Paul Weise (WY-zee) Furniture on Farwell Avenue. Stein says the area has already experienced revitalization. “We’ve got so many other things going for us down here. You’ve got Brady Street rejuvenated. You’ve got Farwell with the new buildings, Prospect with well kept-up older buildings and new buildings. You’ve got it already and you’ve got transportation here for the people who don’t have cars, but most people have cars,” Stein says. Stein says buses already run along Farwell every ten minutes. Ald. Bob Bauman was instrumental in pushing the streetcar through the Common Council. He insists shop owners will thrive, once the line shuttles people past the front door. Bauman admits construction will take a while, but says the build-out will occur in two to three block sections, not miles at one time. “Could it be a month? Possibly. Could it be six weeks? Possibly. But, it would be no different than sewer construction, water main construction, steam tunnel construction,” Bauman says. Bauman points to Portland’s successful streetcar system. It opened with an initial loop downtown in 2001 and now has several extensions. Executive Director Dan Bower says the system averages 17,000 riders per day. “We’ve seen a huge influx and growth in really the small business atmosphere along the streetcar line. The streetcar line is host to thousands and thousands of small businesses now that weren’t there before, and some that were there before are big, big supporters,” Bower says. Bower says he can think of only one business that closed during construction of Portland’s streetcar system. He says the closure happened in 2008 during the recession, and doesn’t think it’s fair to place blame entirely on the streetcar.